Sweetened bean dishes are unusual in Western cuisine but they are quite popular in Asia. We had some black bean pudding left over after making frejol colado and this little experiment is what happened. Turned out pretty well! Combine beans, almond milk, vegetable oil, lemon juice, vanilla extract, and eggs in a blender. Blend until thoroughly combined and the beans have been pureed. Pour black bean mixture into a large bowl and stir in sugar, salt, salt, cloves, cinnamon, flour, and coconut. 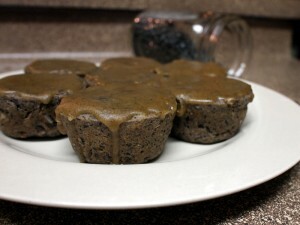 Scoop batter into muffin cups and bake at 350 degrees F for 30 minutes.